Art director Andrew Stellitano, teamed up with the creative duo at Sawdust (Rob Gonzalez and Jonathan Quainton), and photographer Dominic Davies to realize a personal art project: bringing typography and food together. The laser cut concept typographically depicts the three main stages of the narrative in Joseph Campbell’s Monomyth structure: Departure, Initiation and Return. The Monomyth is a basic pattern for events; its proponents argue it’s found in many narratives from around the world. 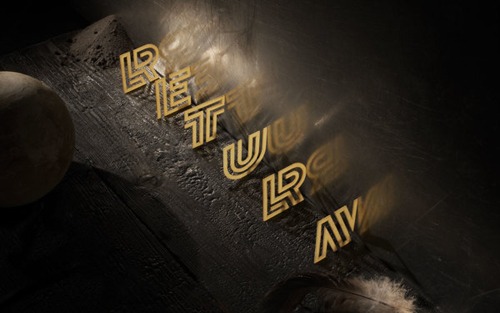 Using dramatic lightings and creative reflections, Sawdust was tasked with developing letterforms that would eventually be laser cut from pasta. “The typeface’s angular structure is defined by (but not limited to) a continuous and sometimes curvaceous geometric line; which allows the letterforms to be freestanding once laser cut from pasta.” This from Jonathan Quainton from Sawdust. Each of the three final artworks were constructed using real laser cut pasta and raw ingredients. The typeface, named Lunetta, is now available exclusively through the foundry Hype for Type. Want more cool typography? Check out top 10 typefaces admired by designers.